David S Duncan (Royal High School) was secretary of the SAAA from 1885 to 1925 – quite remarkable in itself. He was only the second man to hold this post succeeding AS Paterson (1883-1885); he was also treasurer from 1898-99. 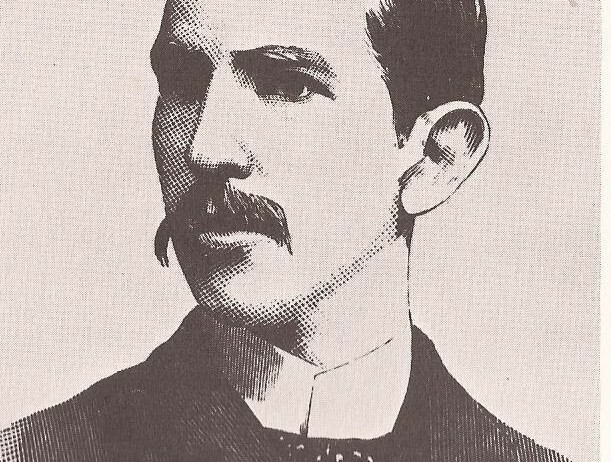 As a runner he won the inaugural SAAA Championship Mile in 1883 in 4:35.0, won it again in 1884, 1885, 1886 and 1891. He set records for the Mile in June 1886 (4:32.2) and 4:28 (1888), for the Two Miles (9:48.2) in 1887 and for the Three Miles (15:32.8) in July 1888. Like many of the sportsmen of his day, he was not a one-sport man, he was multi-talented, and away from the track he was also a scholar and successful journalist. We can start his profile with the tribute paid to him in “50 Years Of Athletics” which was the Jubilee history of the SAAA in 1933. David Scott Duncan, who for many years prior to his death was looked upon as the “father” of amateur athletics in Scotland, was born in Monkton House, Inveresk, where his father had farmed for many years . Aftre a short term in Musselburgh Grammar School, he became a pupil in the Royal High School, Edinburgh, where he remained till he left for the University with a view to qualifying for a legal career. While in the RHS he was looked on as a sound scholar, and left with a very good grounding in Latin, Greek, English and French. He was proxime acessit for the India prize, and in this competition was awarded a special prize on account of the high standard reached. While at school he competed successfully at the Annual Sports; but it was not till 1880 that he took up distance running seriously. During the following eleven years, he won over 150 prizes, and in addition to winning the Scottish Mile Championship five times, he was runner-up three times and held for a short period record for two and three miles. He competed in the AAA Championships and while never a winner, did faster time at Stamford Bridge than he had ever done in Scotland. His record for the Mile (4 min 28 sec) stood for some years. After a short business career in Leith he became the Scottish representative for The Field and continued in this capacity till the Great War. He was a born journalist; his marvellous memory and intimate acquaintance with all branches of sport gave him a pre-eminent place in the journalistic world; indeed it could truly be said of him that in these islands for many years he stood without a peer in all-round knowledge of athletics. Two years after the founding of the SAAA he took over from Mr AS Paterson, Advocate – a distance runner of distinction – the duties of secretary, and for the long period of forty years, guided the destinies of the Association. His legal training, scholarship and above all, his retentive memory fitted him in a high degree for the duties of secretary, and whether in furthering the athletic contest with Ireland, or in conference with sister countries he worthilt upheld the interests of his own. He was a golfer of more than average ability, being a “scratch” player when he captained the RHS Golf Club, but he had a somewhat unorthodox style in driving; indeed his method drew, on one occasion, from a champion golfer and friend of his own, the following remark: “Man, David, if you hit the ball on the back swing, you would be the longest driver in Britain!” For a time he was the captain of the ancient Royal Musselburgh Golf Club. In the royal burgh by the sea members of the Club still recall his eloquence, fine diction, and humour when he presided at their annual dinner. The Golfing Annual of which he was editor, stands as a memorial to his research and hard work. In laying the foundation of his work, he met most of the great golfers of his time, many of whome became his fast friends. But he was at his best during his visits to Ireland with the Scottish international athletics team, and while always anxious for a Scottish win, never failed to congratulate an Irish opponent on a brilliant performance. As a timekeeper and judge he excelled, and one recalls his indignation when in 1908 at the Olympic Games in London an apparently pre-arranged attempt to shoulder Captain Halswell off the track in the memorable 400 metres race was made and failed. It is no secret that in this race, which Duncan judged, it was he who broke the tape when he saw the foul, and “no race” was unanimously declared. 1. Following several abuses of the amateur code, particularly by the cyclists who were represented by two unions – the Scottish Cyclists Union, set up to promote and foster amateur cycling in Scotland, and the National Cyclists Union, which had been founded in England. The SAAA had set up joint championships with the NCU and this led to friction with the SCU and many meetings between the three followed. The rather fraught situation led to many examples of dishonest practice including financial. This will be covered in the Amateurism section of this website. In 1893 a sub-committee was set-up to enquire into the various alleged abuses in Amateur Athletics and DS Duncan was the secretary of this body. The territory at that point included the counties of Berwick, Roxburgh, Peebles, Selkirk, Dumfries, Kirkcudbright and Wigton. The entire article on the topic is well worth reading, but the involvement of DS Duncan was crucial in the setting up of the Association. 3. The series of international fixtures with Ireland was also assisted on its way by the work of DS Duncan. The original proposition was put b the Irish AAA in 1891 and a special meeting of the SAAA was held to discuss it. The invitation was declined at that point despite the Irish offering to host it, provide the officials and the prizes. The idea was felt to have merit and DS Duncan was instructed to open negotiations with them for the establishment of an international contest covering the championship events. In December 1894 the IAAA again put forward a proposal, this time for a meeting on the lines of the annual Oxford v Cambridge contest. This was readily accepted by the SAAA on these conditions: (1) The first contest be held in Scotland; (2) That a guarantee be given to the visiting team to cover their expenses; (3) That the events should be the Scottish Championship events with the exception of the ten miles and that each country should have two in each event but three in the four miles; (4) That in Scotland the shot and hammer be thrown in the Scottish style, and in Ireland under Irish rules. The contest took place on 20th July 1895. The series ran unbroken until 1913 with Ireland winning eleven and Scotland seven. 4. Inter-scholastic sports were organised by the SAAA in 1900 largely through the enthusiasm of the President of the SAAA, EJ Comrie Thomson, and of course the Secretary DS Duncan. Various people and committees were of course involved in making all of these notable events a reality, but the real driving force on most occasions was DS Duncan. No other single person was as active over the long period of his tenure of office.